The release of their latest album Dust And Dirt last year marked an exciting new chapter for the band capturing The Black Seeds’ characteristic brand of reggae-funk fusion at its most authentic and fundamental. From the get go the trippy album opener ‘Out of Light’ with its shimmering keyboards and trippy vocals showcases a reinvigorated band with a more expansive sound. ‘Loose Cartilage’, inspired in part by an AC/DC concert comes flying out of the traps with a beast of a riff before slipping into a funk-laden ‘Black Seeds’ groove. The chilled-out disco dub of ‘Don’t Turn Around’, born out of a spontaneous jam before rehearsal, and the blaring horn line and varied use of instrumentation on ‘Love Me Now’, are testament to a band at the top of its game, revelling in a new found creative freedom. 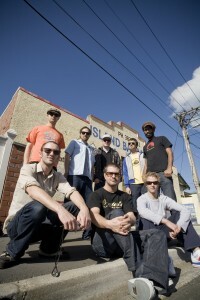 Released worldwide through the band’s own label Proville Records, the album received widespread acclaim, debuting at Number 1 in the New Zealand album charts and achieving some of the band’s best ever chart positions in Germany, UK, United States and Australia, as well as picking up Best Roots Album at the 2012 Vodafone NZ Music Awards. The release was supported by a monster tour run which saw the band performing over 80 shows across three continents, including perfomances at festivals such as Rock en Seine, Lowlands, Sziget and many more. Originally formed in 1998, The Black Seeds is led by the vocals of Barnaby Weir and Daniel Weetman. Lyrically their music expresses messages on different levels. Personal triumphs and failures, relationships good and bad, give a personal insight into the lives of the musicians. Ultimately though, their songs are always under-pinned with an underlying positivity and optimism. The Black Seeds released their debut album Keep On Pushing in 2001, which despite a minimal marketing budget, went on to reach platinum sales in New Zealand. The second album, 2004’s On The Sun, added a heavy dose of funk and soul to their dub reggae sound. Debuting at Number 3 in the NZ album charts, the album included one of the band’s biggest singles to date (‘So True’) and went on to achieve triple-platinum sales in NZ. Third album Into the Dojo, signaled the beginning of the band’s introduction to the rest of the world. Spending five weeks at Number 1 in the NZ album charts, Into the Dojo was then successfully released in Europe through Berlin-based label Sonar Kollektiv, garnering critical acclaim and airplay, particularly in Germany and France. 2008’s follow up Solid Ground continued to build the band’s global following after it was successfully released through trailblazing North American label Easy Star Records. The Huffington Post described the album as ‘…a damn fine record…thick, bottom-heavy, and melodic’, and JamBase labelled it as being at ‘the forefront of reggae today and tomorrow’. 2009’s live album The Black Seeds Live: Vol 1 featured live recordings captured by the band between 2001 and 2009, and was followed by the release of the Solid Ground remix album Specials: Remixes And Versions From Solid Ground.